East Jesus is an experimental, sustainable and habitable art installation located in the Slab City area. 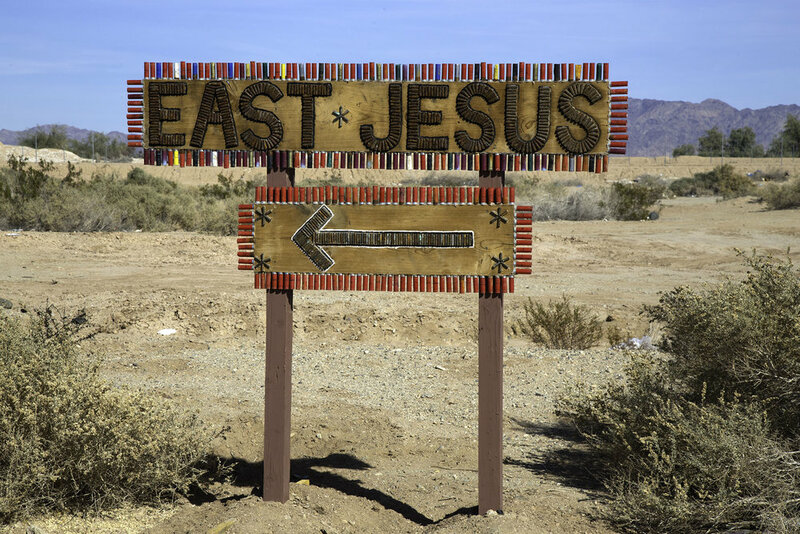 There is no religious connotation in the name East Jesus – it is a colloquialism for a place in the middle of nowhere beyond the edge of service availability; the off-grid facility operates with no municipal utilities. In early 2007, Charlie Russell left his job in the technology industry, packed all his belongings into a shipping container and sent it to a trash-strewn field where he began to surround his two art cars with sculptures that would become the foundation works of East Jesus. The Chasterus Foundation, a 501(c)3 non-profit formed after his death in 2011, has since guided the curation and expansion of East Jesus. Postings include digital photography, links, new work, works in progress, ideas, and more. © Taylor Mickle All Rights Reserved.